Independence Hall is located in Philadelphia, Pennsylvania. It served as the venue where both the United States Declaration of Independence and the United States Constitution were debated and adopted. Independence Hall in Philadelphia, Pennsylvania. The Independence Hall is located at the Independence National Historical Park in Philadelphia, Pennsylvania in the US. From 1775 to 1785, this building served as the principal meeting location for the Second Continental Congress. It is perhaps most famous, however, as the site where the Declaration of Independence and the Constitution of the US were signed into law. These two documents formed the foundation of this country and have provided a framework for other lawmakers around the world. The Independence Hall was inscribed as a UNESCO World Heritage Site in 1979. 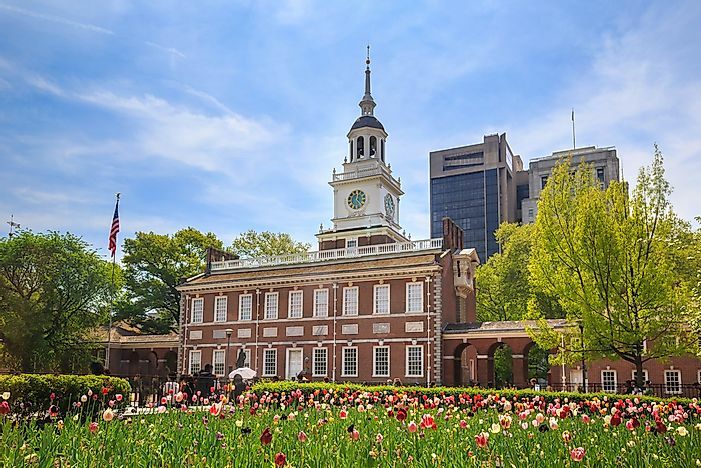 Why Is Independence Hall A UNESCO World Heritage Site? The Declaration of Independence and the Constitution of the US have set forth a model for the global right to democracy and self-government. Independence Hall stands as a symbol of these rights. As such, this building meets Criterion VI (the universal principles of the right to freedom and revolution) to become a UNESCO World Heritage Site. These two documents have influenced the founding documents of many newly forming nations around the world. The main elements of these historical documents were even utilized to create the United Nations Charter. The original purpose of Independence Hall was intended to be the meeting place of the Assembly of the Commonwealth of Pennsylvania. It was the designed by Andrew Hamilton, an attorney, and Edmund Woolley, a master builder. Construction of Independence Hall took place from 1732 to 1753. It was completed in red brick with a wooden steeple, where the Liberty Bell once hung. The building has retained its authentic presentation, with original exterior and interior finishes. Its location, the Independence National Historical Park, adds to the authenticity of the building because the park is home to other 18th and 19th-century architecture. Although the city of Philadelphia owns Independence Hall, it is managed by the National Park Service. The Independence National Historical Park was established specifically to protect and preserve the Independence Hall. Because it is managed by a federal entity, it has a significant amount of protection. Additionally, this building is one of the most important historical monuments in the country. Keeping it preserved and in good condition will always be a principal objective of all levels of the government. A General Management Plan has been created by the National Park Service to guide its administration. Within this plan, it is clearly stated that Independence Hall is also a UNESCO World Heritage Site as an important factor for consideration of its administration. To ensure its ongoing preservation, several attempts have been made at maintaining its security and stability. During the 1990s, for example, the government installed a new fire detection and suppression system as well as a security system. In 2002, after the attacks of September 11, the government implemented stronger security measures in terms of visitor screening. In order to preserve its outer appearance, the steeple underwent rehabilitation efforts in 2013.